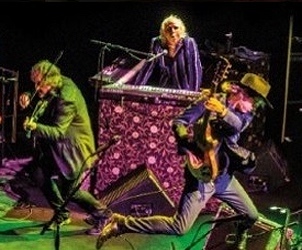 Come see the continuing evolution of The Waterboys. Few bands have changed as much as The Waterboys. Formed in 1983, on their first three albums Mike Scott sculpted a layered post-punk sound, culminating in 1985’s sky-scraping This is the Sea. Since then the music has never ceased to evolve, from the influential mix of Celtic, gospel, country and rock on the classic Fisherman’s Blues, to the fired-up poetic passion of 2011’s An Appointment with Mr Yeats and 2015’s acclaimed return to prominence, the rootsy, funky Modern Blues. The 2016 live version of the band is the same as that who recorded Modern Blues and successfully toured the world last year: Mike Scott on vocals, guitar and piano, Steve Wickham on electric fiddle, great Memphis keyboard player and showman Brother Paul, ace drummer Ralph Salmins, legendary Muscle Shoals bass man David Hood and sharp Austin guitarist Zach Ernst. Their sound bridges the toughness of British/Irish rock and the soulful, funky swagger of the American south.